Research:Classifications turned into a narrative-Modern manbecome Homer! Classifications turned into a narrative-Modern manbecome Homer! Modern man  become Homer! How would you go about gathering all the plants around you in one place and classifying them? Linnaeus solved this problem using Christian theological teachings. After we entered the age of science, a method was devised for a bottom-up organization based on close observation of the subject. But what can we do today, in the age of Internet Technology? The information glut makes systemic classification difficult. That’s why everything is thrown into a database, and people search networks for the information and knowledge they require. We live in an age in which information is provided and shared equally. You may suspect that we live in a world of convenience in which classification is no longer necessary, but a serious problem does in fact existthat is the decline of knowledge. I hope that information and knowledge can be converted into a narrative, creating a new knowledge for the 21st century, much as Homer wove splendid tales during an age without literacy. The son of a pastor, Linnaeus was born in Sweden in the 18th century. 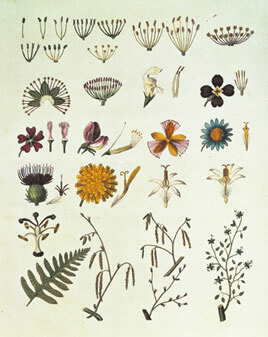 He divided plants into 22 classifications based on the traits of their stamen. As is shown by the Latin names of the seven levels for animals, known by kingdom, phylum, order, class, and the rest, his classifications were modeled after the class order of the age of absolute monarchy in which he lived. This was both easy to understand and easily accepted by the people of his time. He is called the father of taxonomy due to the tenor of the times in which he lived.